A friend of mine recently sent me a link to a slideshow about seven foods believed to help fight against cancer. I absolutely love integrating healthy foods into my diet -- they make me feel like I'm doing the right thing for my body, which then leads me to feel strong, healthy, and usually more full than when I eat processed foods. What I liked about this list was that it was a bit different than the usual foods we always hear about. So, I decided I wanted to share with you! (1) Tumeric - Tumeric can be found in a lot of Indian foods and curries (which I love! -- check out my posting on low calorie naan and a low calorie indian dish that I like called kofta curry). You can also buy it in spice form and add it to your own dishes. According to the article, bright yellow mustard is also full of tumeric - so add a little extra next time you are making a sandwich. (2) Fish -- Fish contain omega 3 fatty acids as well as several vitamins which are thought to help ward against cancer and other health issues. Salmon is one of the best choices, as is halibut. I personally like to eat salmon in my sushi, as I'm not a big fan of it grilled, although that works as well. There are other sources of omega 3 fatty acids as well including nuts, soy beans (edamame), and flax seeds. (3) Orange zest -- This one came as a surprise to me! Apparently the orange peel is as healthy as the orange itself due to its detoxifying properties. 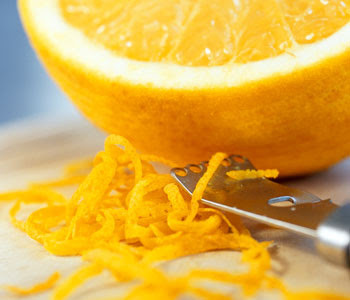 Adding orange zest to food requires more forethought and creativity than other foods, but it can be added to almost anything for a little extra flavor. I like to put orange zest into my water or soup. (4) White tea -- Yep, white tea is full of antioxidants that help prevent against colon problems and inflammation. I buy both white tea and green tea (the tea we usually hear about) and I switch off between drinking each of them. I keep them both in my drawer at work for convenience. (5) Whey protein -- Another one that I thought was interesting! Whey protein can be found in yogurts, or it can be bought in powder form. The powder form is great in cereal, smoothies, or oatmeal. (6) Cranberries -- Cranberries are also full of antioxidants and are thought to protect the body from cancer as well as bacterial infection. Cranberry juice is a great way to drink cranberries, or you can eat dried cranberries or fruit. I enjoy sprinkling cranberries on my cereal, in my fage yogurt, or in my oatmeal. (7) Walnuts and/or Sesame Oil -- Walnuts are full of omega 3 fatty acids and are a great source of protein and vitamin E which helps protect against cancer and other heart issues. If you use sesame oil when cooking, you can reap the benefits of the vitamin E content. Or, you can snack on nuts in your trailmix, on your oatmeal, or on your yogurt. I think one of the most interesting parts of the slideshow/article was the subtle point it makes about not assuming you can get all of these health benefits from vitamins or supplements that carry the same nutrients. What makes these foods so special is that they contain many different components that help improve or maintain our health, elements that might not be contained or included in man-made multivitamins or supplements. Will return to our regular scheduled postings about low calorie foods tomorrow! I can't be more agree with the last part, that's why I don't take more vitamins anymore so I "force" myself to eat more varieties of foods to get all the necessary nutrients. Thank for sharing, it's a great article. Thanks for the list. I didn't know many of these foods had cancer fighting power! great blog - i love all these tips!